GIS manufactures electric chain hoists, crane systems, overhead travelling cranes, slewing cranes, and vacuum handling equipment. With nearly 20% of its staff taking apprenticeships the company invests heavily in its future and that of the Schötz community. Customers in industrial sectors, entertainment, wind power, and agriculture are among those who consume GIS equipment, of which about 60% is bound for export markets. 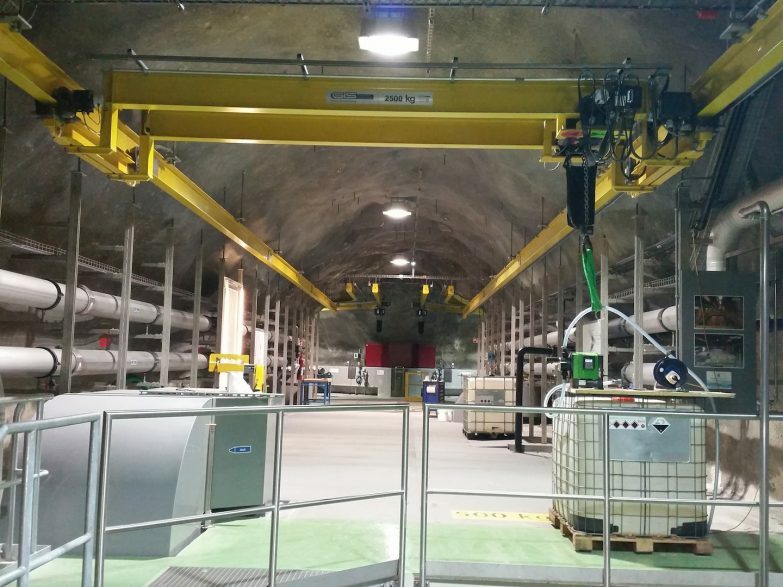 Hidden behind the contours of the Matterhorn mountain, a custom crane system is a key feature of an upgraded wastewater treatment plant in the picturesque Swiss village of Zermatt. Switzerland-based electric chain hoist manufacturer GIS supplied two underslung travelling cranes and nine monorails including chain hoists for ARA Zermatt, which has been treating wastewater from the well-known resort at the foot of the iconic mountain since 1982. The project involved the upgrade of the ARA Zermatt sludge plant to a state-of-the-art membrane bioreactor unit, which is a sewage treatment method that combines a membrane process with a suspended growth bioreactor. The crane system is integrated into the mountain on multiple levels to carry out heavy-duty material handling that is integral to the process. Both cranes are frequency controlled and have extremely low headroom to navigate narrow and enclosed corridors, whilst transporting bulky membrane cartridges. Hoist models GCH2500 (in single fall) and GCH1600 (in double fall) were chosen for the specialist project. The cranes, classified to 2m/M5, are specially designed for the demanding environment and high duty, while the equally durable hoists are classified to 1Bm/M3. The entire construction project took place in several stages over three-and-a-half years, owing to the short construction period between Easter and Christmas. Zermatt is a small village with a population of approximately 6,000 people, but that spirals to 60,000 for the winter season from December to April, during which time the sewage system had to be working at full capacity. 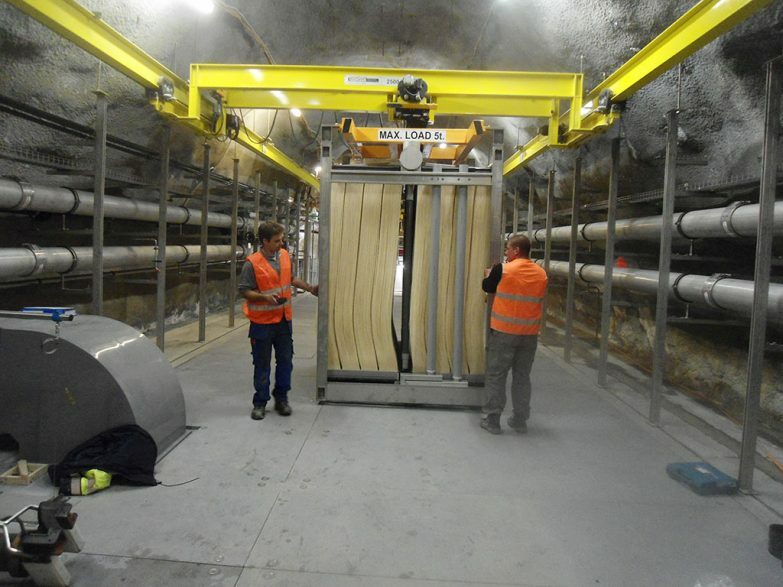 Bühlmann, who anticipates the system to be in use for at least 20 years, explained that parts and components were manufactured “as small as possible” so they could be delivered to the site by truck before being unloaded and transferred into the tunnel system by electric forklift truck. GIS won the order via tender, which involved a site visit and a subsequent bidding process. This was the first time the hoist manufacturer and ARA Zermatt had worked together, although GIS has worked with many other wastewater treatment plants in the past. It has since led operator training and will fulfill an annual maintenance contract. Caption: A membrane cartridge is transported to the installation site using an underslung travelling crane. Caption: The overhead travelling crane transports a container with additives for water purification.